Translating modern song text while sittung in the sun, looking at the Altantic Coast? This is the case at our language camps in Spain, Italy and France. It's the perfect combination of a language and a beach holiday. The language teamers are experienced teaching students who were especially trained during a 4-day seminar. They not only prepare and conduct the language lessons but also are there for you in all situations. You're staying at a campsite or in a youth hostel. The choice between learning english? No problem in Vieux Boucau. Trained language teamer teach you english in 30 x 45 minutes. In our language camps are the linguistic units are so devided that the leisure time and holiday mood do not come too briefly. The toes between the sand, sun is shining and you are listening to the atlantic ocean waves during learning one of both language in a group. A dreamlike feeling is offered you with „SUP“ during the sunset. A refreshing change rich in action pleasingly? Then you should not miss the wild rafting tour. Upwards with this adventure your adrenalin mirror shoots up! A professional guide leads you by the rapids and shows you where to jump into the water. Togehter we explore the surroundings and drive by the nice nature with woods, lakes, beaches and many things more. Here we go on a trip to Spain and to the modern, french bathing resort Biarritz! Visit the nice beaches and go typicall french and spainish shops. In Spain, eat the tasty and typical spanish tapas in small bars. The “Atlantic Park” is gigantic and offers you water slides, a waterfall with mit suspension bridge a comfortably whirlpool. Chill on the pickn-nick meadow and at the snack bar. The matching beach area and free wifi is unique. 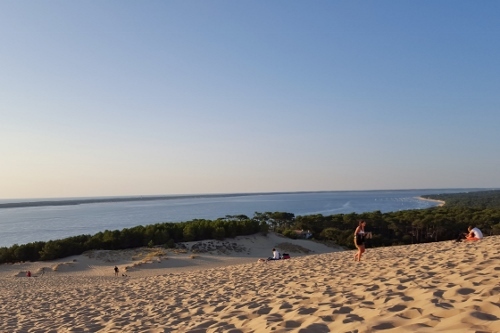 If you have come “on top” of the gigantic sand dune, you will be overpowered by the sight over the Atlantic and the beay of Arcachon. The hightlight is an unforgettable sunset. Self-arranged journey to the language holiday destination is possible. Our teamer team welcomes you at the camp. The travel price decreases about 70,00 Euros. The discount is only valid if neither there nor return journey is taken up in the coach. The Beach Club Albatros offers everything what sunny vacation on the Altantic coast is required. Besides pool, terrace and snack bar there are table-tennis, a football player and a billard table. The amphitheatre and the own Beach Club Albatros disco also provide for a change in the evenings. Wifi is avaible at the pool, te chill out area and the reception. Here you could rent a safe as well. No single reservations in the new look room possibly! Towels are to be brought! In the Beach Club the meals are served as a buffet. Everybody finds something according to his taste and can help himself like he may. You can enjoy your meal on the terrace with a nice sea view. The extensive breakfast provides an energetically start in the day. The pupils could prepare themselves a lunch paket for during the day. The dinner allows to beginn the evening in friendly manner.